the ROSELIAN ARMY OF BATRATHUM has risen up once more to attempt to reclaim the land of ANTORIA that they lost in the 43rd War of Darkness. Threatening to start War of Darkness 44, KING LANCELOT BARTHOLOMEW ROSELL of the ROSELIAN EMPIRE sends his beasts through the lands, corrupting and destroying everything in their path. Refusing to hide from the incoming threat, a young recruit at the MOTOR KNIGHT ACADEMY named JOY LANTZ leaps into action! With the power of DIVINE LIFE granted to the MOTOR KNIGHTS through their DIVINE ARMOR, and her powerful signature weapon, the hybrid motorized lance-drill BURST ARM known as the JOYLANCE, JOY refuses to let anybody stop her from saving the world-- not even the ACADEMY itself! EXTREME MOTORIZED ACTION! 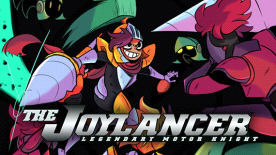 THE JOYLANCER: LEGENDARY MOTOR KNIGHT has a large selection of local multiplayer components, allowing up to four players to play at the same time, in almost every game mode! Get up to three friends in the action in the MAIN GAME by giving their souls to your weakened foes! Cooperate with your friends to complete the mysterious DARK PALACE Mode! Battle against each other in huge skirmishes and various duels in the MOTOR COMBAT mode! The Dark Palace -- Explore the mysterious palace containing a variety of combat challenges! Can you survive the many floors of the THE DARK PALACE?